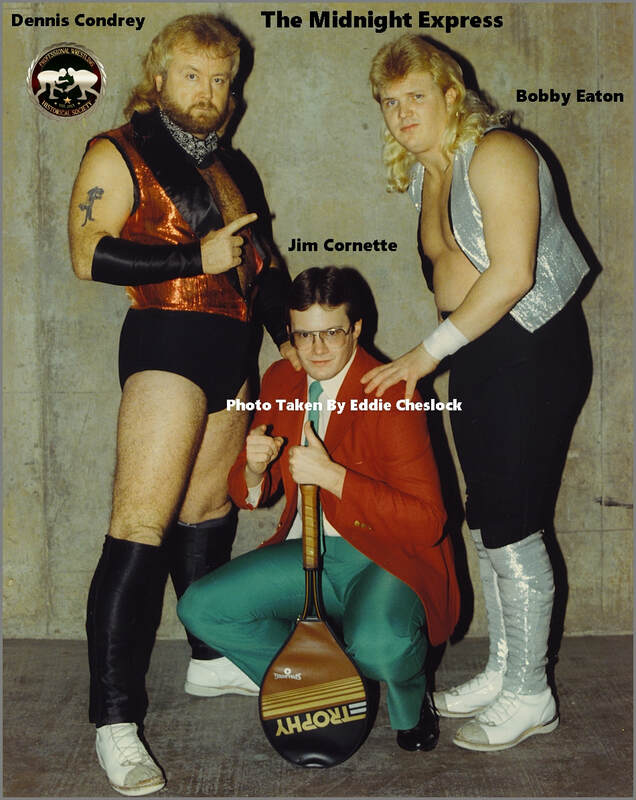 ​Hello PWHS members, and welcome to my latest article in which I explore something that, according to Jim Cornette, almost happened, The Midnight Express, Dennis Condrey and Bobby Eaton, along with Jim Cornette, going to the World Wrestling Federation! The Midnight Express was started by Dennis Condrey. At various times the group Included Condrey, Norvell Austin, Randy Rose, and at one point, Wayne Ferris, aka, The Honky Tonk Man. Now, that was in Memphis. Eventually, Dennis Condrey, Jim Cornette, and Bobby Eaton were all working for Bill Watts in Mid-South Wrestling. Watts wanted to pair Condrey up with Eaton, with Cornette as manager. According to Jim Cornette, they were asked by Watts to come up with a name. Condrey said, "What about The Midnight Express?" Watts loved it, and they all went from there. They worked in Mid-South, then WCCW, then went from there to Crockett's promotion which aired on TBS, or WTBS as it was known for a time. However, things could have been different. In 1986, Jim Cornette and his Midnights went to New York to meet Vince Mcmahon. The WWF was interested in adding them to the roster, but it wasn't meant to be. Jim Cornette has said when they went up there, Vince showed off the action figures they were making at the time, made by LJN, but Cornette and his Midnights didn't understand why people would buy action figures of them when they'd be coming in as heels. Of course they later learned they could have gotten $86,000 in royalties from those action figures, but all worked out in the end for the Midnight Express. That is until Jim Herd, who ran WCW for a short period, came along and did his best to break up Cornette and The Midnight Express! So, what could have happened, if The Midnight Express and Jim Cornette, came into the WWF in Summer of 1986, and were pushed to the moon? Let's find out shall we! The British Bulldogs went to a time limit draw with The Hart Foundation when they got attacked by a mystery team. The team was identified by WWF color commentator, Jesse The Body Ventura, as The Midnight Express and their manager, Jim Cornette! Later that night, Mean Gene Okerlund interviewed the team. "Well let me tell you something Geno, the reason the Midnight Express and I are here is because of what we've been hearing about the so called tag division you have here in the WWF. Everyone's saying the WWF has the best tag teams. Well, how is that possible when you don't have The Midnight Express, Loverboy Dennis and Beautiful Bobby?! Go ahead and answer that Geno. (Gene tries to answer, but gets cut off) EEH! Times up! The answer is, You don't! It's not possible to have the best team division, when the Midnight Express do not work for you! Well, now we're here, and we'll see whose the best! We'll show the entire world, what they should know already, and that's the Midnight Express is the best, and we're better then the rest!" The following week, the Midnight Express have their first televised match for the WWF! After the match is over, Jim Cornette cuts an in ring promo on The British Bulldogs! "Well Geno, If the Bulldogs have any guts, they face us in this ring next week, but I've been told, the Bulldogs won't be here next week! Well, doesn't that just figure? The Bulldogs got a case of limber tail and a yellow streak down their backs!" The British Bulldogs came out and attacked The Midnight Express, driving the Midnight Express to the back! The Midnight Express beat The British Bulldogs after Jim Cornette hit Davey Boy with his Tennis racket! "We came here to face the best the WWF has to offer! Not a couple of bugs! Next week we want the Bulldogs! two out of three falls! We'll show we are the best in the world!" The British Bulldogs beat The Midnight Express by disqualification in the third and deciding fall. The Midnight Express won the second fall in 22 minutes and 47 seconds. The Bulldogs won the first fall at 15 minutes and 35 seconds, and the final fall in 28 minutes and 14 seconds. After the match, The Midnight Express attack The Bulldogs and Cornette knocks each of them out with he tennis racket. WWF House Show - Washington, D.C. The Midnight Express and The British Bulldogs went broadway (1 hour time limit draw). The Midnight Express and The British Bulldogs went broadway. The British Bulldogs beat The Midnight Express by disqualification. There was build-up for Saturday Night's Main Event which was to be held in November 1986. The British Bulldogs wanted The Midnight Express in a steel cage match at SNME. The Midnights accepted the challenge on one condition. There was to be no escape! Only way to win was to pin your opponent's shoulders to the mat or make them submit. The match was made for SNME. The Midnights and The Bulldogs feuded for the rest of the year. They had one last match on December 27, 1986 in Hersey, Pennsylvania, which was a disqualification for the Bulldogs. In 1987 The Midnights won their first WWF World Tag Team Title. The match may have been Heel vs. Heel but the audience was behind The Midnight Express! The Midnight Express were attacked by The Hart Foundation! Hart Foundation's face turn! The Hart Foundation got sneak attacked by The Midnight Express! Dennis Condrey piledrove Bret Hart on the concrete floor! It was announced that at WrestleMania III, the Midnight Express were to defend the WWF World Tag Team Titles, against The Hart Foundation. The Midnight Express and Jim Cornette had quite the ride in the WWF by this point, but, the wheels were about to fall off the bus! Dennis Condrey grew tired of the travel. He wanted to leave and put in his notice. Six weeks later, Loverboy Dennis was gone! With no partner, Bobby Eaton and Jim Cornette took an offer from Jim Crockett Promotions! Six weeks later, a new version of The Midnight Express, Sweet Stan and Beautiful Bobby, with Jim Cornette, debuted on World Championship Wrestling on TBS, officially ending the WWF run of The Midnight Express! Eaton's last WWF match, was a loss to Tito Santana, on WWF Superstars of Wrestling, that aired one week after his debut for JCP! Well, I hope you enjoyed this fantasy. This was, What Could Have Been, if only the Midnight Express and Jim Cornette had gone to the WWF in 1986. Of course, chances are, They'd been a mid-card team and eventually not even that, but this being a fantasy, some liberties were taken! That's all from me this time! Until we meet again, save me a ringside seat! What Could Have Been: Chapter Four - Read Here. ​Other articles by Shea can be Read Here.